Intermittent fasting is getting some time in the spotlight right now! It might seem like a quick road to weight loss, but is it really? And what can you really expect when you start intermittent fasting? Read on to find out! This post is for intermittent fasting beginners who want a summary of everything they need to know to start intermittent fasting with confidence! There is a simple yet broad meaning to intermittent fasting. Intermittent fasting just means going for a period of time each day (or week, or month) without eating, or eating very little. It’s usually done for health benefits over emotional or spiritual reasons, but not necessarily. This is also one of the first times in human history that we aren’t fasting on a regular basis. There are loads of different ways to do intermittent fasting too. It’s not a one-size-fits-all type of deal! Some people get more benefit out of fasting than others. Some choose to do it a couple days out of the month or week, and some do it for longer than others. While the interwebs are shouting that intermittent fasting is magical and great for everyone, there are some people who will do better without constant food, and there are some people who shouldn’t even start intermittent fasting. I’m not a doctor (obvi) so if you have health concerns that you think could make it tough to try fasting, such as diabetes, talk with your doctor first to see if you should focus on other health issues first. Same goes for you if you’ve been struggling with an eating disorder. Heal your view of food before taking more food away. If this is you, try starting out by reading the book 8 Keys to Recovery from an Eating Disorder by Carolyn Costin and Gwen Schubert Grabb. I’ve heard great things about it, and it’s written from the perspective of someone who’s been there. You can most likely start intermittent fasting if you’re already fairly healthy. It’s best to start when you have a flexible schedule. Note that if you have kids or aren’t living alone, that might make it harder to start intermittent fasting. It’s tough to keep to your goals if you’re cooking for kids or there’s food around in the evening. I don’t think I could do intermittent fasting if my hubby wasn’t on board with me… It’s great to have his support and no food temptations in the evening! Intermittent fasting stresses out your body. So how could it be good for you? As you fast, your body doesn’t need to put as much energy towards digestion, so it can give that energy straight to you instead! Many people who try intermittent fasting say that it helps them to feel more focused and energized. Intermittent fasting also causes fatty acids -called ketones- to be released into the bloodstream. Studies show that this can protect your memory and slow disease processes in the brain! Fasting intermittently can help you get into ketosis more quickly. I started intermittent fasting to get more energy in the midst of a strict diet for healing, and I was surprised at how well it helped my cravings! According to Ayurvedic medicine, your digestive fire is strongest around 2 pm (and science is starting to catch up and support this idea). This is when you should have your biggest meal. Other than that, it’s pretty much up to you! But I do have a couple suggestions. 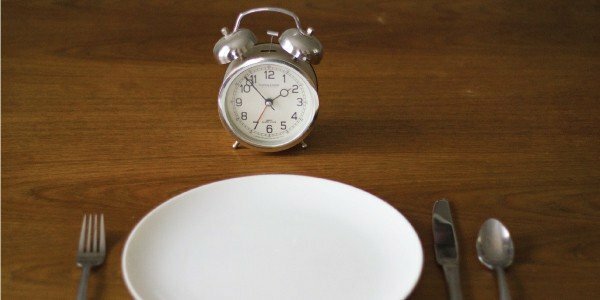 Lots of people do intermittent fasting by delaying their first meal until later in the day, but I believe that for some people, the benefits of fasting don’t work as well if you skip breakfast. If you don’t naturally wake up and feel a bit hungry, and it’s easy for you to skip breakfast, this can sometimes be an indicator that your hormones aren’t balanced. Our natural hormone release in the morning should trigger some hunger. But intermittent fasting should help with this too! My opinion is that when you start intermittent fasting, you should try it both ways. Some people feel more focused and responsive when they delay their first meal until 2 or 3 pm. If you try it this way, you can have a cup of plain herbal tea or black coffee in the morning to help offset any feelings of hunger. A hot liquid does wonders at satisfying hunger! Others feel best when they eat a light breakfast shortly after they wake up. But try it out one way for at least a couple of days, then switch it up, and see how you feel! Do whatever makes you feel best. If you’re looking for another option on when to do your intermittent fasting, you might want to look into 5:2 fasting. This type of fasting simply means eating like normal for five days a week, and then reducing your intake to just 500-600 calories twice a week. For more info on this fasting method, check out this post: The 5:2 Diet: What it is, 7 Myths About It, How to lose 50 lbs, Recipes, and More. 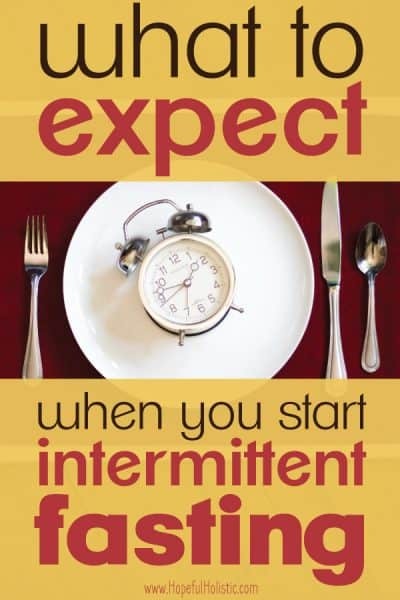 To start intermittent fasting, first, decide on your intermittent fasting schedule. You’ll want to decide around what time periods you’ll be eating, and how long you want to fast. For example, when I’m intermittent fasting, I have breakfast around 10:30, and I’m done eating around 2-3:30. This way I can get in around 19-20 hours of fasting. 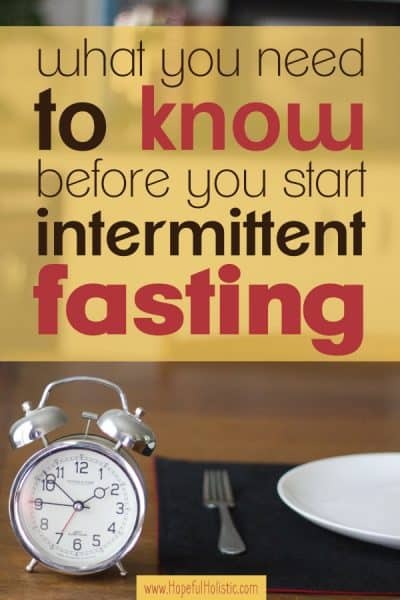 One of the most common types of intermittent fasting is 8/16, which means 8 hours of eating and 16 hours of fasting. So if you ate breakfast at 11am, you’d stop eating around 7pm. If you’re just starting out, begin with about 14 hours of fasting and build up from there. So, the day you start fasting, you might eat breakfast at 8 am, eat a little extra food that morning and afternoon, and have your last meal or snack at around 6 pm. To start out, ease into the number of days per week you do intermittent fasting too. Try it for a few days and keep track of the results and how you feel! You don’t need to be too strict in sticking with your chosen time periods, but try to start and finish eating around the same time every day. You’ll eat more during this time period than normal, and that’s ok! You don’t want to feel like you’re starving while you’re fasting. No one likes a hangry dieter. Also, it’s still important to have breaks in eating so that your digestion doesn’t have to work constantly. You can still have three meals, and snacks, but don’t spend the whole morning and afternoon eating. Now, of course, you can eat anything you want within your time limits when you start intermittent fasting. But I have a couple suggestions for how to start eating after fasting, beat the energy slump, detox, and feel your best while you’re intermittent fasting! In the morning, drink plenty of water, and start off light to break your fast. You should ease back in to eating because your body hasn’t had much to digest for a while! I like to start off with water and fresh lime juice, and sometimes I’ll add some powdered greens or organic apple cider vinegar. This helps your body start detoxing for the day! Green smoothies are also fantastic first thing in the morning- I love mixing in some super greens for added nutrients. I also usually put in a couple scoops of Great Lakes Collagen, which boosts metabolism, adds protein, and increases your energy and your body’s ability to detox. Then I add in almond butter (raw and sprouted are the easiest to digest, which is important first thing in the morning!) and/or flaxseed or chia seeds for some extra superfood protein. Almond butter and flaxseed also help add some calories, which can be helpful when you decrease the amount of time you’re eating each day. Other than that, add some frozen berries, a handful of spinach, shredded coconut if you want, and either water or milk for a wonderful fast-breaking, yummy, nutritious smoothie! Another way I make sure I’m getting in my nutrients for the day is with Nourish me Naturally– a tincture packed with herbs rich in vitamins and minerals. It’s like a multivitamin in tincture form! I put a couple dropper-fulls in my water bottle and drink it throughout the day. There are also a few ways to minimize your energy slump when you start intermittent fasting- cuz who couldn’t use more energy, right? Maca powder is a great way to get an energy boost without a crash! Maca is a starchy, slightly-sweet, beet-like root veggie that grows in South America. It’s also an adaptogen that helps balance hormone levels, and can even support fertility! Seriously a magical (and delicious!) nutrient. I get my Maca powder directly from The Maca Team– it’s fair trade, high quality, certified organic, non-GMO and you can get the exact kind of Maca that’s best for you. Take the quiz to find out what kind of Maca you should use with the Maca Finder. My favorite way to use Maca powder is in my coffee substitute recipe. It’s a delicious, healthy, caffeine-free drink that’s perfect if you’re starting to eat later in the day (when you shouldn’t have caffeine) but still want something like coffee to sip on! Matcha tea is another way to boost your energy without experiencing a crash later on. It has tons of antioxidants too! Matcha can get kind of expensive, but this one is a fantastic deal. I also add Energy Plus to my water each morning- it’s an herbal supplement that gives you iron and energy with no crash or side effects! Throughout the day, make sure you’re getting nourishing food. Stay away from processed foods, sugar, and anything that might make you crash while you’re fasting. Other than that, you can stick with any diet you’ve been on when you start intermittent fasting. I’ve been keto while intermittent fasting, as well as dairy-free, paleo, and left with extremely limited food choices due to health issues. I’ve done intermittent fasting in the middle of these dietary restrictions, and it’s been fine. Just make sure you’re getting enough whole foods, veggies, nutrients, and calories when you start intermittent fasting. Don’t just eat for the sake of eating. Eat to nourish your body! Listen to your body and add in different food or nutrients if you need to. You’ll need to plan to take more food with you throughout the day than you normally do. If you’re in a rush and need a snack to go, nuts or seeds are a good option. A handful of pumpkin seeds with shredded coconut is delish! Or go for almond butter on an apple, yogurt, or chia pudding- although you’ll need to prep that last one ahead of time. It’s not hard to fill up on quick snacks that are ALSO healthy! You can drink while intermittent fasting. During your fasting period, make sure you’re drinking plenty of water. Staying hydrated is important, especially while fasting! And this might go without saying, but don’t consume any calories during the fasting time period. You can have coffee while intermittent fasting (this can help with hunger, especially in the morning) but don’t add cream or sweetener. You can have plain herbal tea at night, but don’t add anything to it. This tea is my favorite for relaxing right before bed. I wish I’d known a couple more things when I first started intermittent fasting. It all turned out just fine and I love it, but now I know some stuff that I’d like to pass on to others! Here are a couple of tips to help you out intermittent fasting beginners when you first start intermittent fasting. You’re used to eating a certain amount throughout the day every day, and you might not eat quite enough to fill yourself up when you first reduce the amount of time that you can eat. The time you’ve chosen to finish eating can kind of sneak up on you… A few hours into your fasting period, you might notice that you’re hungry and ready for dinner! If you’re super hungry, go ahead and have a snack. Try to eat more the next day. If you’re just a bit hungry though, go ahead and keep fasting! It’s not harmful to go to bed hungry. You’ll catch on quick to how much food you need during whatever hours you’ve decided to eat. It might be helpful to do some food prep so your food is ready for you during the times you’re eating more. I love using my Pyrex glass food storage containers to reduce my use of plastic (and the toxins that come with plastic). They come in all the sizes you’ll need -for snacks, whole lunches, and more- and they’ve lasted me ages! So when I started intermittent fasting, I realized something odd. I ate plenty during the day… But in the evening, even though I wasn’t hungry, I still wanted to just put something in my mouth at dinner time. If you’re used to having dessert, or a late-night snack while watching a movie, you might need to work through those habits. Food can be comforting, but it’s not going to solve your problems. You can live without it for a while! Don’t eat fast when you get back to your eating period either- slow down and enjoy your food, and try not to overeat just because it’s your eating period. When I tried fasting in the morning, I also had to work through my dependency on coffee. I didn’t want caffeine after 2 pm, but I didn’t start eating until 3- but I still wanted caffeinated coffee! My coffee substitute was a life-saver and helped me not to miss coffee at all. Most of us don’t even realize we have these habits with food. When you start intermittent fasting it might bring up some dependency issues that you’ll need to address. Embrace the times you can practice saying no to taking comfort in food while you’re fasting. Habits aren’t permanent, and working through them can help transform you into the person you’re meant to be! The first time you start intermittent fasting, one of the most important things you can do is to listen to your body. Do good for yourself and ease into intermittent fasting while paying attention to how your body responds for the most benefits. Drink plenty of water, and eat good food while you aren’t fasting. You might experience some hunger, headaches, tiredness, irritability, or cravings during times when you aren’t eating, especially the first few days. But stick with it and they’ll go away! However, there are some intermittent fasting side effects you need to keep an eye out for. If you find that you’re regularly dizzy from low blood sugar, intermittent fasting might not be for you. If you’re one of the few people who doesn’t handle intermittent fasting well, and the side effects continue for days, don’t continue with it. The benefits aren’t worth it if fasting is making you feel like crap! You can expect to see benefits! After the first few days of possible side effects, you can expect to start seeing changes! You’ll feel more awake and energized, your mind will feel sharper, and if you’re carrying extra weight, you might start to see the numbers on the scale change. Studies have shown that weight loss from intermittent fasting usually happens only if you’re reducing your caloric intake and not overeating. This happens naturally with most people, due to the decreased window of eating. You simply don’t have as much time to eat as much as you did before, and so you won’t eat as much. That in itself can help you lose weight! If you want to keep an eye on your weight and overall health, the Etekcity scale is incredibly accurate! It syncs with an app to tell you your weight, body fat, muscle mass, and more. One of my favorite benefits of intermittent fasting is the free time I got in the evening. Instead of working on dinner and spending time cooking and eating, I get to catch up on chores or just enjoy time with my husband after he gets home! It’s inevitable that the time will come when you’ll have something food-related going on in the evening. It’s fine to switch in and out of intermittent fasting, but it might take some practice to switch back and forth without over- or under-eating! And when you start eating in the evening again after a period of intermittent fasting, it might make you feel different. For me, whenever I ate at night after a time of intermittent fasting I felt… heavy. It was like my evening meal was just sitting in my stomach. Sleep didn’t come easily those nights. I knew I hadn’t been overeating, but my digestion seemed like it wasn’t quite used to dealing with food at night. I think our digestion isn’t really made for lots and lots of nighttime eating, and intermittent fasting really makes that obvious. If you’ve been intermittent fasting for a while, it might be best to try not to have late night meals. Even if there’s food available, you can say no! It might help you sleep better. Learn from my mistakes and give your body a little transition time between periods of intermittent fasting. Try to keep your biggest meals earlier in the day, and don’t eat late at night. Feel free to comment below if you have any other questions about intermittent fasting… I’d love to help you out! I love that you included a “what to expect” area! I love IF and have used it for years but same thing: I could have known a couple more things feeling wise before I jumped into the first few! My husband does intermittent fasting from time to time and feels great when he does it. This post is inspiring me to try it out for myself! That’s awesome! You should let me know how it goes for you! My husband did intermittent fasting and did very well on it. It’s something I want to try because as you said it’s hyped up now. Great info! I plan to start IF in the near future. There are so many benefits that come along with it. Great tips! I have been hearing a lot about this type of fasting lately. Thank you for the info. I have been wanting to try and give it a go. I will definitely be doing it now that I have more info on this type of fasting.